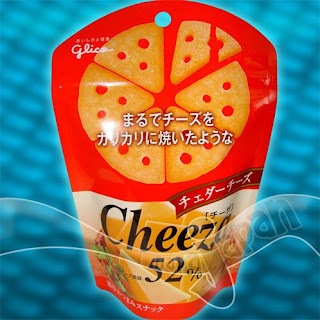 Japanese Candy: CHEEZA is sure to "PLEEZA!" CHEEZA is sure to "PLEEZA!" Not often does a cracker come to mind when I am craving for a salty and crunchy snack. I am more of a Doritos and Pringles fan. Between these two brands I can enjoy sampling about 25 different flavors each year! But sometimes we all need to mix things up a bit and try products outside of our confectionery comfort zones. 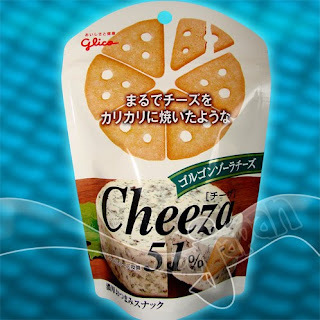 Especially when a reputable company such as Glico comes along with a totally new and unique product: CHEEZA! It has actually been around for over a year but I imagine that it will be catching on overseas very soon. They are shaped like mini pie pieces, approximately 2.5 cm long from tip to edge. The resealable foil bag (which I doubt you will need to reseal) contains 38 grams of crackers. I find very little breakage since the crackers are of a decent thickness and hardness. 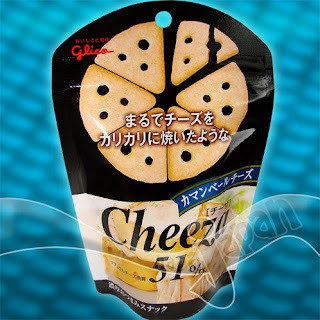 When I first discovered Cheeza last year I was thinking that it would be a boring cheese cracker only to be nationally accepted due to its new, unique shape and packaging. Boy was I wrong! Cheese! Cheese! Cheese! I still wonder how they can get so much accurate and deep cheese flavor onto, and into, these little crackers. Over 50% real cheese used! I can only compare Cheeza's taste to the savory and cheesy flavor you get from nibbling on the burnt cheese from the edge of a nachos pan. But that may only partially describe the Cheddar Cheese flavor. Gorgonzola and Camembert are in a totally different league. The richness in flavor makes these perfect appetizers with wine or beer. The taste is very deluxe and the pleasurable flavor sticks in your mouth well after the cracker has been consumed. No toppings are necessary even though the back of each package suggests various ways to serve them. If you really want to match them with something why not toss them into a fresh green salad. We carry all 3 flavors at napaJapan. Stay tuned for more blog updates. Tell your friends about our blog and please enjoy browsing our store. New products are listed weekly! Mr Jay, sent email to the CSR. Looking forward to your respond. Thanks!